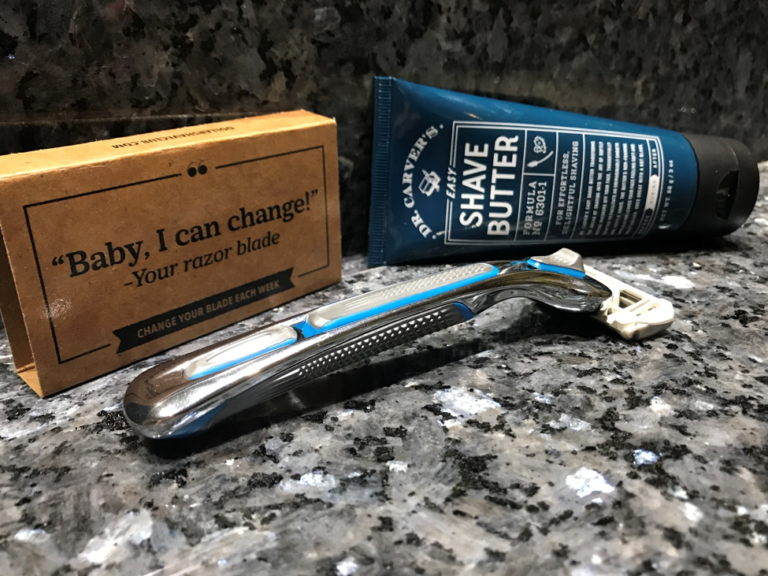 So, we’ve decided to partner with the Dollar Shave Club to bring you this product review and show you how easy it is to subscribe. It is a high-quality product at a great price, so why not? There’s no store that I know of that offers a high-quality razor, 4 cartridges, and Shave Butter for only $5. They list it as a $15 value, but you still couldn’t find all those items in a store for only $15 (none of any decent quality anyway). Dollar Shave Club even includes free shipping with the offer. It’s $9 per month after that but you can cancel at any time or customize delivery options so the replacement blades don’t come every month. The one problem, however, is that I may be the worst person to review the Dollar Shave Club shaving kit. The reasoning behind that statement is that my facial hair comes in quicker and thicker than most. I’m one of those guys whose 5 o’clock shadow starts making its appearance around noon and with any kind of razor (I’ve tried them all), there’s always trace amounts of immediate post-shave stubble. But we’ll get back to that. The Dollar Shave Club Stater Box is only $5 and that includes free shipping. It includes the Executive Handle, 4 Executive Cartridges, Dr. Carver’s Shave Butter (3 oz), and ‘Bathroom Minutes’ – their monthly magazine that’s filled with grooming tips, random information, and humor. It’s a $15 value for only $5. Not bad at all. The main impetus for the grooming brand is to help men take care of themselves efficiently so they can look and feel their best – without paying an arm and a leg for the experience. It’s a pretty simple concept really; deliver high-quality blades and shaving accessories like the Dr. Carver’s Shave Butter at a low cost. The limited-time special offer we decided to take for a test run is the 1-month trial that comes with the handle, razors and shave butter – again for only $5 and free shipping. The ‘Executive Handle’ has a nice clean look and has some weight to it giving it a solid, premium feel. 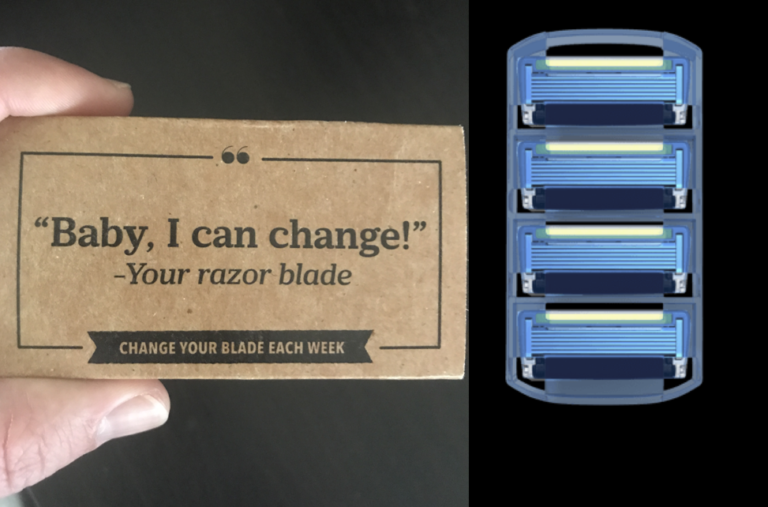 The ‘Executive Razors’ come in a humorously-labeled box and each cartridge has 6 stainless steel blades and a special trimmer edge. You can feel how close the shave is on the first glide. 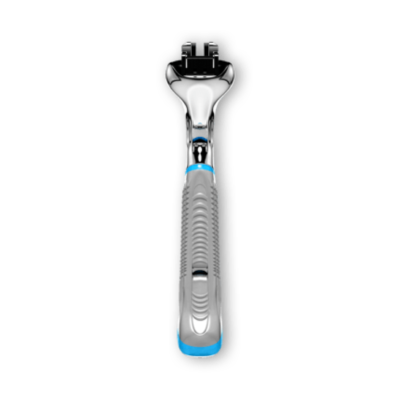 It doesn’t pull on thicker parts of your beard or take up skin like other razors. The ‘Dr. Carver’s Easy Shave Butter’ was a pleasure to use. It’s a shaving cream alternative that is somewhere between a gel, cream, and lotion that has a freshening feel going on and allows the skin-hugging, very sharp blades to glide across even my stub-covered neckline. Despite the thickness of my facial hair I was able to get a closer, cleaner shave than I can remember with any major brand or Amazon-bought shaving kit. 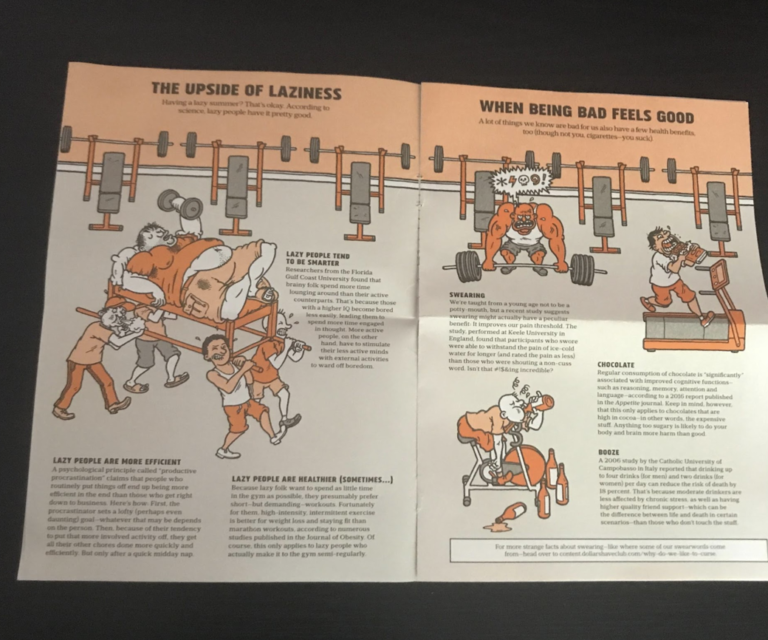 I highly recommend the Dollar Shave Club Starter Kit to anyone who has had lifelong frustrations with their razors or to anyone simply looking for a practical shaving solution. Overall, I found it to be the closest (yet still comfortable) shave I’ve ever had at home – and by far the most economically logical with the multiple replacement razor delivery options. 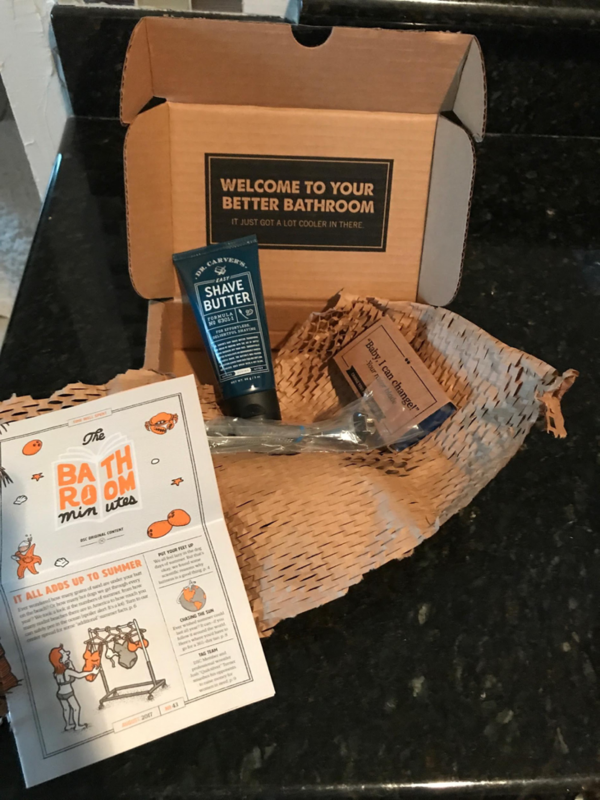 Also – Dollar Shave Club has more than just razors and Shave Butter… They have a great collection of premium grooming products for hair styling and various shower needs that you can get delivered right to your door. Before DSC you had to go to the store and look at a wall of razors that were either cheap and flimsy or expensive and full of gimmicky technology you didn’t need. Now you don’t have to step foot in a store to get an amazing, high-quality shave and grooming products. We’ll deliver them right to your door! Try the $5 starter box today!